If the recipient is absence, the mailman leave a notice for you. In this case, you should be contact to the local post office. (United kingdom, Germany, Australia, etc). The Art & Creative Materials Institute, Inc. The Art and Creative Materials Institute, Inc.
(ACMI) is an international association of over 200 art, craft and creative material manufacturers which seeks to promote safety in art and creative products through its certification program. Many small companies, as well as large ones, participate in the ACMI product certification program. We are very proud of the fact that nearly a quarter of these companies are long-standing members (20+ years) of ACMI. For over 70 years, the ACMI program for children's art materials has certified that these products are non-toxic (AP Seal) and meet voluntary standards for quality and performance. In 1982, the program was expanded to include a much broader range of art materials, including adult products, ensuring that they are non-toxic (AP Seal) or carry appropriate health warning labels (CL Seal) where necessary. ACMI-certified product seals (AP Non-Toxic and CL Cautionary Labeling) indicate that these products have been evaluated by a qualified toxicologist and are labeled in accordance with federal and state laws. Each product in the program undergoes extensive toxicological testing that covers both acute and chronic toxicity concerns before it is granted the right to bear the ACMI certification seal. The ACMI product certification program includes on-going review of the latest scientific and regulatory information available to keep the program current as well as a built-in five-year review of product formulations to meet the requirements of the Labeling of Hazardous Art Materials Act. ACMI's toxicology team, located at Duke University's Division of Occupational and Environmental Medicine, has over 30 years experience evaluating more than 60,000 art material formulations for ACMI members. ACMI also has a Toxicological Advisory Board composed of leading toxicological experts who act as a review board on issues of toxicity, review the criteria use by ACMI's Toxicologist, and make recommendations to ACMI. Is this a hair pastels? Many people questions to us...... This is not a Hair pastels. But, many people use to hair dye. Hair designer or Usually people..
Maybe, it because easy hair dye and easy remove. Apply to the hair well. 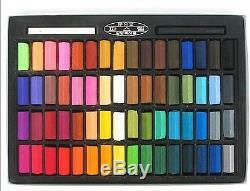 64 Color Non-toxic Chalk Pastel set. Model name : Non-toxic Soft Pastel Set. Color : 64 Colors assort in Cardboard box. Size : Square Chalk / 1 inch. Notice : Note the impact and Avoid moisture. (United kingdom, Germany, Australia, Kuweit etc). We are willing to respond to your inquiry. It is the fastest way to settle your concern or issue. The item "New Non-toxic 64Color Square Chalk Soft Pastels Set" is in sale since Wednesday, June 06, 2012. This item is in the category "Crafts\Art Supplies\Drawing\Pastels". The seller is "greetingebuyer" and is located in Daegu. This item can be shipped worldwide.